Welcome to the 2015 Paper Based Advent Book Blog! Day Thirteen’s selection brings us sweetly contemplative swathes of everyday living from the sister isle, proof that Tobago has always been leagues more than Trinidad’s touristic sibling sidekick: Elspeth Duncan’s Tobago Peeps. A collection of Duncan’s columns on living in Tobago, originally published in the Trinidad Guardian, these pieces have at their core a steadily reflective heart. The author, who wears many creative hats — also working as a Kundalini yoga teacher and boutique restaurateur of Table for Two, Made For You — distinguishes herself from a herd of lukewarm, generic presenters, who offer vapid portraits on Tobago as an “idyllic paradise”. There is much that is sublime and magnificent about the island, her people and their particularities: the strength of these assembled columns is that they view the space and its inhabitants from an embracing and inclusive perspective. From rescued roadside birds reposing peacefully in Heineken boxes, to empowering and rib-tickling anthems printed across the windscreens of idling gas station cars, the vision in Tobago Peeps is of a steady, connected gaze — one that sees smiling dogs, sage rastamen and seven-ingredient health juices in all their limitless, love-strewn potential. We recommend it for: fans of Elspeth’s short story collection, Daisy Chain, who’re eager to sample her nonfiction style; those seeking a uniquely charming read for their next Store Bay stroll; anyone interested in Tobago’s richness and depth, beyond the brochure signposts. An Evening of Tea and Readings, March 8th – Paper Based Turns 27! Our official event flyer, designed by Reynold Hackshaw. The beginning of 2014 saw our Tea and Readings series revitalized, with a successful event in February. Just one month later, we were equally excited to host March’s reading, for many reasons, including our celebration of Paper Based’s twenty-seventh birthday! In her opening remarks, Paper Based’s owner, Joan Dayal, expressed how grateful she was that our festivities shared a calendar page with International Women’s Day. Joan Dayal says a few welcoming words to the gathering. To commemorate the occasion, we assembled a lineup of writers with various literary backgrounds, whose works span several genres and formats: literary fiction; romance writing; poetry; short stories. Nzingha Job reads from her journals of poetry. Nzingha Job’s poetry launched us into the evening. Job, a former TEDxPort of Spain speaker, read poems that tackled issues of both personal limitation and public confrontation. Her readings moved from a rapid-paced, self-professed “rant”, to what Job described as more inspirational fare. Speaking candidly and forthrightly about sexual policing of the individual; of creative growth and emotional turmoil, Job’s poems echoed with a triumphant, underlying message of positivity, even in times as uncertain as these. Hugh Blanc shares an excerpt from his current work in progress. Hugh Blanc took to the podium next, reading an excerpt from his second novel, which he’s in the process of writing. Blanc said he expects to have the sophomore offering completed later this year. The extracts he shared display the same dense description and sensitive character analysis that define Blanc’s first novel, the Kirkus Review-starred Between Bodies Lie. We were early fans of Between Bodies Lie, selecting it as our first-ever Book Club Pick last year. We’re excited to see what future signposts of success are in store for Blanc’s blossoming literary career. Elspeth Duncan reads interlinked stories from her novel in vignettes, Daisy Chain. Elspeth Duncan’s unusually-formatted novel, Daisy Chain, has won favour with those seeking nonconformist tales of women’s interior lives. When Duncan shared three of the stories from Daisy Chain, it was easy to see why: the prose is deceptively simple, packing an emotional punch in each examination of a single woman, whose life interlaps with many other females. The stories spellbind, whether they’re describing a woman’s desire to remove the clown makeup her husband so loves, or another’s consuming desire for the young girl who mows her lawn. One guest described Duncan’s style as bearing both “a creative imagination and a light touch”, which is a perspective we’re happy to second. Nathalie Taghaboni reads from her second novel in the Savanoy series, Santimanitay. For Nathalie Taghaboni, this reading marked another event in her homecoming tour. Taghaboni launched two novels in the romance series, The Savanoys, at NALIS on Friday 7th, March. 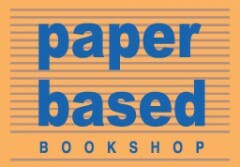 Paper Based was proud to be that event’s official bookseller, and equally happy to invite the writer of Across From Lapeyrouse and Santimanitay to our birthday reading. Taghaboni shared scintillating moments from both novels, her readings proving that the books have a fiercely colourful, Carnival-inspired heart. Monique Roffey shares selections from her forthcoming novel, House of Ashes. The evening’s feature reader, Monique Roffey, is no stranger to Paper Based: she’s been a tireless supporter of the shop, and she launched her last novel, Archipelago, here. 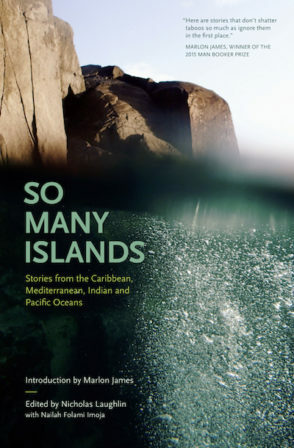 In addition to Archipelago (winner of the 2013 OCM Bocas Prize for Caribbean Literature), Roffey’s novels have been consistent prizewinners, shortlistees and recipients of other honours. We were especially thrilled to hear Roffey read from her brand new novel, House of Ashes, forthcoming in June 2014. This was the first time that any excerpt from House of Ashes was shared in a public forum, and from Roffey’s first word, the audience was hooked. The novel focuses on the events surrounding the 1990 coup in Trinidad, and is conducted from dual points of view: that of a hostage victim, and a gunman. Roffey treated the evening’s guests to perspectives from both sets of narration, and it’s difficult to decide which was more entrancing. This new novel already promises to be a gripping affair, in its stark, vivid depictions of desperate civil unrest, and of the emotional tour de force that such scenarios inevitably represent. Ruth Osman Rose performs, with Raf Robertson accompanying her on keyboard. Jazz musician Ruth Osman Rose set the audience’s feet to tapping, and even got a lively refrain echoing through the Normandie’s marketplace foyer, as she performed her set. Such was the abundant, affirmative energy radiated by Osman Rose, that she sent patrons scampering right to our register, to purchase her debut CD, Letting Go. Trinidad’s next major literary event is, of course, the NGC Bocas Lit Fest! In case you haven’t already marked the dates firmly in your planners, this year’s festival takes place from the 23rd to the 27th of April. Paper Based will be a fixture during Bocas, as we’ve been proud to be since the festival’s inception in 2011. In the run-up to #bocas2014, we’ll be highlighting several of the books and authors on this year’s soon-to-be-released programme. Our next official newsletter, slated for release in the first week of April, will focus exclusively on Bocas Lit Fest content! Two of Paper Based’s youngest readers share a moment after all the evening’s formalities! We’re grateful to each of you who came out to partake in our birthday revels, and to everyone who continues to support Paper Based. Whether we see you as regularly as clockwork each week, or on your annual visits back to Trinidad, we appreciate your commitment and loyalty to our shop. In your company, we look forward to many, many more birthdays in service of independent, literary Caribbean bookselling! All photographs by Desiree Seebaran.